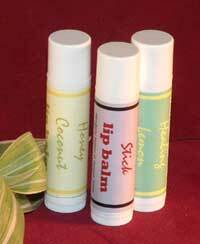 Our lip balms are petroleum free and made with natural ingredients. They're not "flavored" lip balms. The ingredients and pure essential oils are what make them smell so wonderful. Even though they smell good enough to eat, we recommend that you just use them on your lips!